Massage therapy can help relieve pain, speed recovery from injury or surgery, and reduce stress. Men may think of massage as an occasional treat or a vacation indulgence, but this type of therapy could be a natural way to stay healthy and pain-free. One of the most common health issues for older men is chronic pain, defined as pain that lasts more than 12 weeks. This includes back pain, headache, cancer pain, and arthritis pain. Then there are the everyday aches from daily living. All of these act as barriers to a healthy lifestyle. Massage also can help with recovery from injury or surgery, and its relaxing qualities are a surefire way to reduce stress and tension. “It can be one of the best types of medicine—if you approach it as such,” says Markoski. Muscle soreness. A 2014 report in Archives of Physical Medicine and Rehabilitation studied the effects of massage therapy on relieving muscle soreness after exercise. Healthy sedentary adults exercised their legs using a leg-press machine until they were fatigued. Afterward, half of the group received leg massages. While everyone experienced soreness after exercise, those in the massage group reported that their soreness was gone 90 minutes after massage. The exercise-only group’s soreness lasted 24 hours after the workout. The researchers pointed to the fact that blood flow increased with the massage group for up to 72 hours, while the exercise-only group showed reduced blood flow after 90 minutes. Increased circulation can help muscle recover quickly and reduce the incidence of muscle injuries. Low back pain. One 2011 study in Annals of Internal Medicine explored how massage compares with medication in relieving chronic back pain among 400 people ages 20 to 65. The massage group received hour-long massages weekly for 10 weeks. Afterward, almost 40% reported their pain was better or gone, compared with just 4% of a control group who were treated with anti-inflammatory medication. Surgery pain. Research in the August 2015 Complementary Therapies in Clinical Practice found that 20-minute massages given two and three days after cancer surgery reduced pain and tension. Most massages last 30 to 90 minutes. Your licensed massage therapist (make sure he or she has the LMT designation) will consult with you beforehand to review any health issues and whether you need extra attention in certain areas. If you’ve recently had surgery or you have a serious injury, such as a muscle or ligament tear, first check with your doctor. Massage therapy may all look the same, but there are different styles that focus on specific issues. (See “Different strokes.”) Which style is best depends on your needs. How often should you get a massage? Again, it depends on the individual. Some people use massages to address specific issues or injuries as needed, while others schedule them as weekly or monthly maintenance. 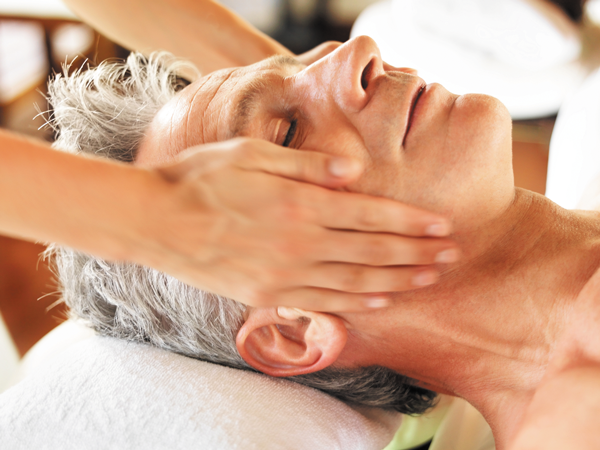 Either way, massage therapy can play an integral role in a man’s health care. Swedish massage. This uses a series of long, gliding strokes designed to soothe aching muscles, relax connective tissue, and improve circulation. It’s ideal for newcomers and those wanting a basic, relaxing massage. Deep-tissue massage. This targets tissues and muscle deep below the skin’s surface in order to release tension, minimize knots, and mobilize fluids within the muscle tissue. Deep-tissue massage shouldn’t hurt, but it is often less comfortable than a regular Swedish massage. People with specific muscle pain benefit the most. Structural massage. Structural massage realigns and lengthens muscles that have become unbalanced or shortened from built-up stress and allows bones and joints to return to their natural alignment. It is especially helpful for people with postural or back problems. Trigger-point massage. This is designed to relieve pain caused by small, constricted areas of muscle called trigger points. For example, a trigger point in the neck may cause pain in the head. Trigger points often are a result of injuries, overuse, muscle strain, and emotional distress. Sports massage. Similar to Swedish massage, this style focuses on healing, recovery, and preventing and treating sports-related injuries. Chair massage. This is an option for people who are uncomfortable with being partially unclothed or cannot lie down comfortably.